This shirt has the classic style you need for any period look, with a folded over collar, lace up front, and full sleeves. The sleeves also have ties at the cuff, so you can wear it with a full length sleeve or cinch it up at the elbow for a shorter length. 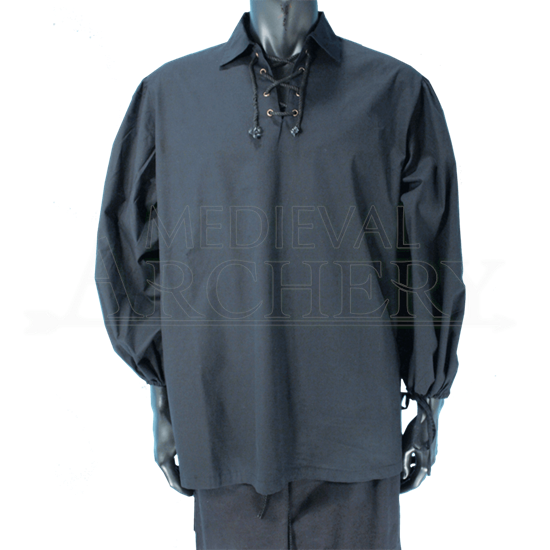 Our Medieval Swordsman Shirt can be worn with a variety of Medieval, Scottish, or Renaissance outfits. Made from 100% cotton, this shirt is very comfortable to wear and easy to care for. We do pirate reenactment and I purchased these shirts for my husband who is a big guy and they are amazing - they are so roomy and comfortable that after purchasing him a natural color one I also was a returning customer and purchased a black one as well. He wore it to our 1st festival this season and had many compliments on it everyone wanted to know where we purchased it from! Great company, great quality products, fast shipping, love doing business here!!!! Great value. This shirt is well made and sizes are spot on. Very comfortable.